This is what it’s been like meeting a Mongolian Throat Singer busking on a Sydney Street, in the dark of night. I had no idea that this chance encounter would not only become a lifetime friendship, but lead to spending 9 days rumbling through Mongolia as part of an amazing car rally five years later. Deciding to sponsor a truly worthy organisation in Mongolia was the natural consequence of events. My wife and I used to spend many a Friday night at the movies in Sydney’s grungy Newtown. One night in particular I heard a haunting sound from the past. “That’s a Mongolian throat singer or Nepalese nose singer” I said to my wife, who just gave me her usual loving “You’re weird you know” stare. We back-tracked and saw Bukhu sitting in the dark entrance of a shop front with his horse hair fiddle, atop of a box. He generously demonstrated his amazing nose, throat, abdominal ‘singing’ techniques – what an absolute treat. We dropped some money in his fiddle case, muttering “Ooooh! I’d love to take him home!! !” and went off to see Michael Caine in “Harry Brown”. Not long after it was my 59th birthday and my daughter, Emily, came down from Brisbane and took me for drinks … and, oblivious to me, played her part as decoy. I arrived home to be greeted by Bukhu, decked out in full Mongolian gear, and a houseful of family and friends, (some of whom were musicians). Bukhu mesmerised us all, not only with his music, but his command of the situation, leading the others in great jamming sessions. It turned out Bukhu, aged 25, had been trying – with great difficulty and to no avail – to get his wife, Chimka, out to Australia. They’d been apart 18 months. “I’ll help you” I impulsively blurted, “How long have you got?”. With only two weeks left to secure a visa, I kicked myself for not holding my tongue. Nonetheless, Chimka got the visa. After paying to sleep in the lounge at a friend’s for many months, Bukhu was excited to be offered a corridor in Newtown. Whilst we were indeed happy for him, we thought it might be nicer for Chimka to have an actual room! With my stepson having recently moved out, we offered his studio to Bukhu for a few weeks. The few weeks turned out to be five great years. In that time Bukhu and Chimka have shown themselves to be of the highest character, and we love them dearly. Bukhu managed to secure their permanent residency by being granted the limited Distinguished Talent Visa – a feat won by only those unique and masterful in their field of talent. They have worked hard and saved to buy a unit in Sydney – we’re very proud of them. If it hadn’t been for Bukhu stirring my interest in Mongolia, the fact that he and Chimka came into our lives so serendipitously, then enriched it in such a delightful way, I may not have thought of doing the Peking to Paris with Sebastian Gross. The Bristol 403 may have just rambled and cruised around Tasmania, Cairns, travelling the Nullabor and the vineyards of South Australia. Peking to Paris was beyond any plans I’d had; it was more like reaching for the stars! It’s funny how that small random act of turning around on a dark night to investigate a ‘star’ has changed our lives for the better – such a little act for such a rewarding consequence. Peking to Paris was one outstanding consequence; the Bright Light Organisation is another. It so happens that Bukhu’s got a big sister who has a big heart and she is involved with the Bright Light Organisation, a group of tireless contributors who work with disadvantaged Mongolian women, girls and their children. We really admire people who give of themselves to help others and the Bright Light Organisation is giving back in such a constructive way – helping people gain independence and self-respect, building a future for themselves and their families so they are able to contribute back to their society. 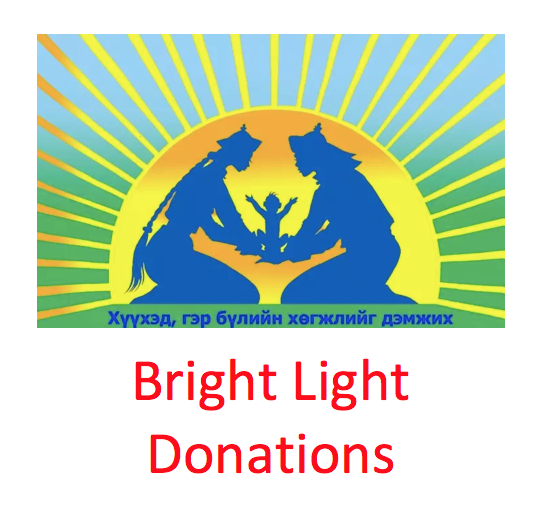 The Bright Light Organisation relies on private sponsorship and we are very happy to play a part in supporting them, as they make a difference in the lives of so many. Catching that curve ball has lead to journeys that we would not have otherwise had. We are so fortunate it came our way and, I have to say, Bukhu and Chimka are definitely bright lights in our lives.